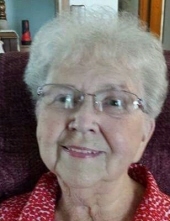 GETZ, Joanne - age 83, of Fenton, passed away Saturday, January 26, 2019. A Celebration of Life service will be held on Saturday, February 16, 2019, at Fenton First Presbyterian Church, 503 S. Leroy St. Fenton with Reverend David Eshleman officiating. The family will receive friends from 3:00 p.m., with Joanne's "Celebration of Life" at 4:00 p.m. at the church. In lieu of flowers, contributions may be made to McLaren Hospice. Joanne was born November 18, 1935 in Detroit, the daughter of Stanley and Melba (Smith) Nowicki. She married Ralph C. Getz, Sr. on May 22, 1954. Joanne was a very social and active person. She was a member of the Red Hat Society, Eastern Stars and Daughters of the Nile. Joanne enjoyed golf and loved spending time with family. She was a volunteer probation officer for many years for the City of Harper Woods where she received an award of recognition for her volunteer services. Joanne is a presence that will be missed. Surviving are: husband, Ralph C. Getz, Sr. of Fenton; son, Skip and husband, Tom Getz-Walsh of Fenton; daughter, Kathy and husband, Mike Romphf of Eastpointe; sister, Carol and husband, Red Lemke; beloved aunt, Betty Mayham; many nieces and nephews. She was preceded in death by: her parents; brother, Stanley Nowicki, Jr.; sister, Melba Motson. Tributes may be shared at www.sharpfuneralhomes.com. Arrangements by Sharp Funeral Homes, Fenton Chapel, 1000 W. Silver Lake Rd., Fenton. To send flowers or a remembrance gift to the family of Joanne Getz, please visit our Tribute Store. "Email Address" would like to share the life celebration of Joanne Getz. Click on the "link" to go to share a favorite memory or leave a condolence message for the family.